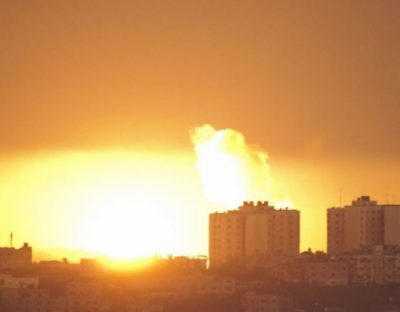 The Israeli army fired, on Monday evening, tank shells and missiles into what was described as a “monitoring post” run by the al-Qassam Brigades, the armed wing of Hamas, in southern Gaza, and many missiles into Palestinian lands, in northern Gaza. The army claimed, “it was retaliating” to shells fired from Gaza. The Israeli army said it used tank and fighter jets in striking the Hamas-run post, and held the movement fully responsible for the escalation in the besieged Gaza Strip. Palestinian sources reported structural damage. The army also fired seven missiles into Palestinian lands, in the northern part of the Gaza Strip. It claimed that several homemade shells were fired from Gaza into the “Hof Ashkelon Regional Council” of settlements, and that one of them was intercepted by the Iron Dome System, while the rest apparently landed in open areas. The army added that the Code Red alarms were triggered in several areas, in Hof Ashkelon; there have been no reports of damage or injuries. Also on Monday, the soldiers shot 149 Palestinians in several parts of the occupied West Bank, including Jerusalem, and the Gaza Strip, as the army continued to use excessive force against Palestinians protesting the illegal U.S. recognition of occupied Jerusalem as the capital of Israel, the Palestinian Health Ministry has reported. It is worth mentioning that the Israeli army have killed two Palestinians, and injured at least 1114, on Friday, December 08, 2017.